Totally Revised 2009.12.15 - See Also: old Panorama page, My Gigapan Page, All Panoramas, Boston Panoramas, Sudbury Panoramas, China Pans, Paris Pans. These are some of my favorites: Path to Frosted Memorial Forest, the First Parish Steeple Panorama, Quantuck Bay, Quogue Beach, the Louvre, Tippling Rock and the Wyndwold Livingroom. Each for its own reason. 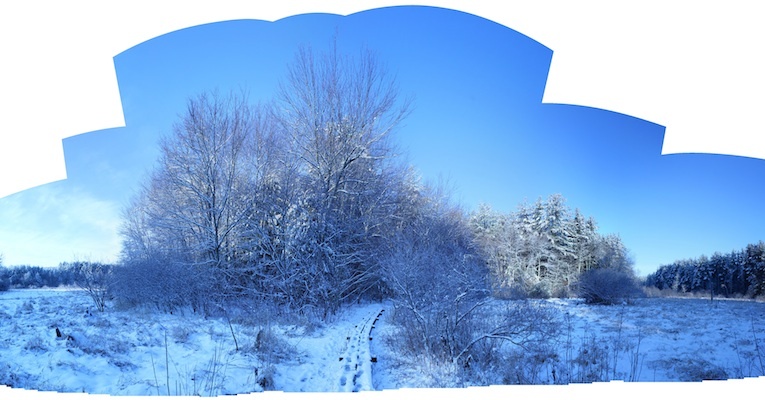 Path To Frosted Memorial Forest 16469x8610 ( 87MB uncompressed JPEG ) Stitched from 25-35 separate 4752x3168 pixels images with Photoshop - a lot of overlap, so, I'm not sure they all got used. Shot on the morning of January 17th, 2013 in the SVT's Memorial Forest. FPSsteeple04.jpg 9450x1148 8 MB: OriginalImage - from 4x6 prints, then scanned, then stitched by hand for many, many, many hours. From the First Parish steeple after a freezing rain storm. January 2004 Hi-Res < > Google Earth KMZ for Sudbury Panoramas. This was my first and is still my favorite. It definitely qualifies as Art. It has lots of features of interest in the foreground, a nice horizon featuring Goodman's Hill in the center and Nobscot, and the freezing rain on the trees gives it a wonderful visual quality. QuantuckBay.jpg 10395x978 7.282 MB Summer 2004. Also stitched by hand in Photoshop - before it had much panorama support. Here is another Quantuck Bay panorama looking up Quantuck Bay from Rogers Beach Pavillon <> larger 6080x1873. QuogueVillageBeach.jpg <> Hi-Res 16724x5144 39.2 MB 2009.11.20 : Taken with GigaPan in collaboration with Gail in July 2009. Interesting foreground and simple and beautiful horizon. Tippling Rock 24520x3084 43 MB : Original image stitched together from 4 gigapans because the top is overgrown, so, you could not get the full panorama from one vantage point. A month after I took this, the brush at the top and a few trees were cleared to give a spectacular view. As a work of art, this may be lacking, but, it is rich in detail and has the highest GigaPan "Explore Score" of any of my GigaPans. It is also a good example of a Boston Panoramas, even if you can only see the Hancock and the Pru, it still counts. Printing Panoramas or very large prints? I've had many many panoramas printed by Light Sound over the past five years (2009-2014) and I have always very pleased with the results (pigment on lustre). When an extra large print was damaged in shipping, I sent them photos of the damaged shipping box and they put a new print in the mail the next day!